The subprime crisis may have started the fall, but the financial crisis was precipitated by a run on shadow banks. As this paper shows, there is an inherent weakness in the shadow banking system that makes it vulnerable to future bank runs. if confidence in the credit puts guaranteed by the institutions erodes, depositors move to redeem their funds. Absent a backstop, in the form of government guarantees, a run on the system ensues. As the chart shows, starting in 2008 the shadow banking system collapsed, with wholesale funders panicking en masse and removing 20% of their money within the space of a couple of years. That’s a huge drop. The same thing didn’t happen in the traditional banking system because their funding comes mostly from retail depositors like you and me, and we had no reason to suddenly panic since we knew the FDIC had us covered in the event our bank failed. So perhaps we should provide a similar backstop for the shadow sector? But any permanent guarantee would come at the cost of added regulation. The authors propose regulating financial institutions based on function rather than form. This makes sense. 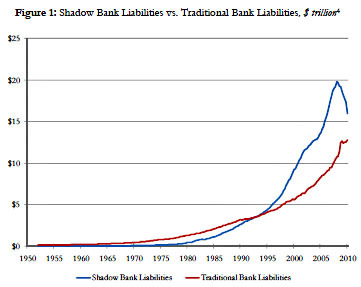 Banks and shadow banks essentially perform the same function — financial intermediation. Regulation by function would remove the need for shadow banks that thrive on regulatory arbitrage, and focus on institutions that add economic value. That’s a novel idea, no? And I think the current financial reform bill makes a few small feints in this direction, though nothing that seriously affects the structure of the shadow sector. We’ll probably need them to destroy the world a second time before we consider taking any further action.